Jenny Graham Cycles Around The World In Under 125 Days, Shattering Record It took just over one-third of a year for the Scottish cyclist to cover some 18,000 miles on her bike, enduring everything from flat tires and worn-out gear to being wary of bears in Canada. Scottish cyclist Jenny Graham stands at the Brandenburg Gate in Berlin after she circumnavigated the world by bicycle in just under 125 days. She left from Berlin, riding east. And on Thursday, she returned to Berlin, riding from the west. In between, Scottish cyclist Jenny Graham rode thousands of miles to become the fastest woman to ride around the world unsupported. It took less than 125 days — just over one-third of a year — for Graham to complete the ride, covering some 18,000 miles on her bike. That lopped nearly three weeks off the old record of 144 days set by Paola Gianotti in 2014. Her official time: "124 Days, 10 hours and less than 50 minutes," according to filmmaker Mike Webster, who helped document the trip. Graham, 38, pedaled out of Berlin in mid-June. Since then, she has endured a number of hardships, from flat tires and worn-out equipment and gear to being wary of bears in Canada. But from the wide open roads of Australia to the steep hills of New Zealand, there were also stretches of jaw-dropping scenery — some of which she documented on Instagram. From the start, there were the friends and strangers who cheered her on. Some even hopped on their own bikes to give Graham some company on her long ride. Others helped her find food or shelter along the way. 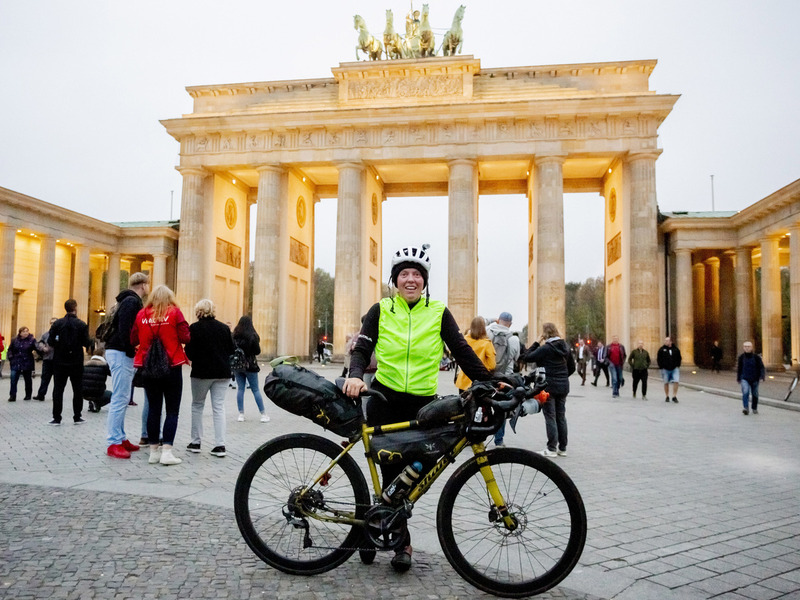 Graham pedaled through more than a dozen countries, including a stretch through Russia and into Mongolia and China, all while carrying her own gear. When she first laid out her route, she estimated that the ride would require some 660,000 calories, as she planned to spend 16 hours on the bike to cover 180 miles a day. On one of the last long stretches of her journey, Graham rode from Alaska to Nova Scotia, dipping down from Canada to pass through North Dakota and other U.S. states. She then boarded a plane to Portugal, where she rode from Lisbon to Berlin — a distance of nearly 3,000 km (1,864 miles). By reaching Europe, Graham was finally on the last lap. Even fatigue, sleeping in the woods and a fall in France didn't stop her from averaging 22 mph on the roads of Belgium as she sped toward Germany. While she fell short of her initial goal of beating the record by 34 days, Graham's achievement has inspired and amazed, with elite athletes and bike commuters alike praising her on social media. Congratulations also came from Juliana Buhring, a previous holder of the women's mark, who rode 18,000 miles in 152 days on a different route in 2012. "I am so proud another woman has finally smashed my record. It's about time!" Buhring wrote on Twitter. "Big hug Jenny. What a ride. Enjoy that rest." Guinness World Records, explaining its rules for this record, says that "a rider must travel the same distance as the circumference of the Earth — 24,900 miles — in one direction, starting and finishing in the same place. Travel by sea and air is allowed, but at least 18,000 miles of the route must be cycled." By setting a new mark, Graham will likely satisfy critics who contend that Guinness should not have awarded Gianotti the record in 2014. Starting in March of that year, the cyclist had been riding for more than two months when she suffered a fractured vertebra in an accident. She was allowed to suspend her attempt for four months before finishing the circumnavigation in late November. Pending official review, Graham is poised to join her fellow Scot Mark Beaumont as the fastest male and female riders to circle the planet. Beaumont, who set his mark in less than 79 days, sent Graham his "heartfelt congratulations." When she's not riding around the world, Graham works in the education and social work field in the Scottish Highlands. If you'd like to retrace her trip around the world, you can follow the weekly diary she filed for the BBC. It turns out Graham isn't the only person making headlines this week for an attempt to ride around the world. Britain's Charlie Condell, 18, rode thousands of miles through Europe and Asia, hoping to become the youngest person ever to accomplish the feat. But his bike was stolen in Australia this week, throwing his plans into doubt. Already more than 100 days into his journey, Condell hopes to continue. He tells Australia's ABC that offers of help have poured in and that he could still finish his trip before his 19th birthday in March. After news spread that Condell's bike was taken from outside a hostel where he was staying, bike company Cervelo said it would send him a new one. Condell's itinerary calls for him to head to New Zealand next, before riding across the middle of the U.S.